This Hampton Nautical hanging gimbaled desk stand compass is a solid brass reproduction of an antique sailing ship cabin compass. The compass is mounted on a 360-degree double gimbaled ring system on a heavy brass base. The gimbal ring design allows the compass to remain level regardless of the angle of the base. The bottom of the base is covered with felt to protect your fine furniture. The compass is held up by a solid metal pole and is suspended in the air. The compass rests firmly on a wood base. This solid brass compass is beautifully detailed and polished to a high luster. 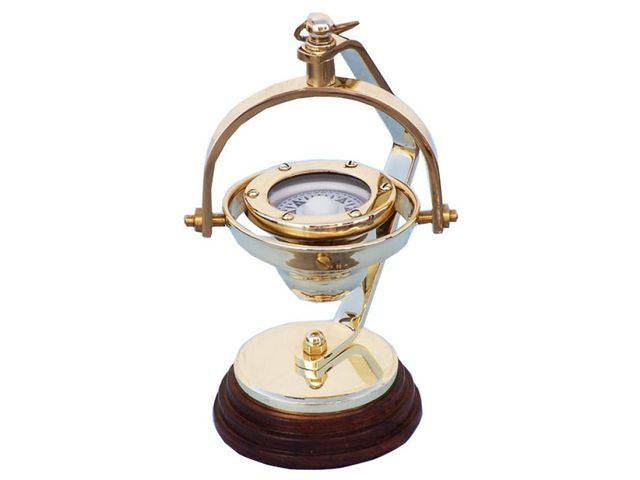 Delight the engineer in your life with this vintage brass compass and let them marvel at the historic and fascinating tools that lead to the discovery of the new world. Perfect for the technically minded, these brass compasses demonstrate two very simplistic, yet amazingly inventive and revolutionary devices. The compass, little changed in its 3000 year history, demonstrates the ingenuity of ancient civilization. Created in China the early compass was often a simple needle on a piece of cork, or tied to a silk thread, later becoming the single most important navigational tool in history. Utilizing the Earth’s magnetic field to point the way the brass compass came to revolutionize life at sea, allowing ships to explore the vast expanse of the ocean and steer a correct course without the need for points of reference. Similarly, the gimbal is a spectacular device that earned its keep aboard countless vessels. Using concentric rings, each with an axis along one of the dimensional planes, the gimbal allows for the stationary and upright position of an object to remain as a ship moves in any direction. Each of these brass compasses highlights the technical advancements made in sailing; tools and devices so important that they are still used even today. For that special someone who is fascinated by how things work, these brass compasses make a remarkable and thoughtful gift.